Is this 200tpi wide slick the perfect all-round road tyre? Schwalbe’s Kojak tyre is a wide slick targeted at a broad range of riding, from utility/commuting through to fast touring and recreational road riding. It comes in a range of sizes, from 16″ tyres that you’d find on pre-schoolers’ bikes right through to 700C. They are generally around 35mm wide, with some outliers, and they are relatively light for their size: 330g in 700C (vs 440g for a 28mm Armadillo) or 295g in 26″ (vs 350g for a 26 x 1.2″ Gatorskin). 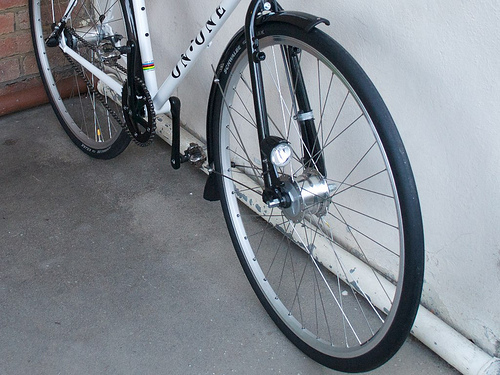 You can get these tyres at a considerable discount (with free shipping) from Chain Reaction (also in 20″ size). Obviously narrower tyres can come in lighter – Schwalbe’s Ultremo racer weighs just over 190g. For most of us, one of the significant disadvantages of a wide tyre (the aerodynamic penalty of pushing aside an extra wedge of air) doesn’t apply, unless you’re time trialling and probably reading the wrong sort of review! When it comes to speed then, the Schwalbe Kojak are deceptive. On a 23mm slick pumped up to 110psi you really feel the road surface through each of your contact points- the bike feels very lively. This isn’t so much the case on the 35mm Kojak. Even running the tyre at 100psi doesn’t give the same ‘chatter’ through the seat and bars and this definitely gives the bike less of a pedigree racing feel, even if you’re actually pedalling faster on their buttery smoothness. On the velodrome boards, there can’t be much doubt that the Kojak falls behind thin, rock-hard road tyres. While the construction of the tyre is quite supple, it’s not on a par with something like the Continental GP4000s. However, on the open road the picture’s much less clear – every time your bike vibrates on real life road surface you lose the energy required to lift your bike and body into the air. 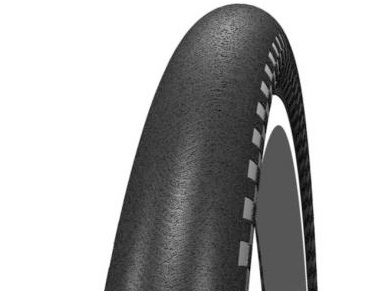 Schwalbe manufactures the Kojaks from a 67tpi material and the carcass comprises three layers, for a total of 200tpi. Unhelpfully, where other manufacturers add up all layers to give their published total, Schwalbe doesn’t – but don’t let the low number fool you. If Continental manufactured the Kojak it would be quoted at 200tpi. The huge advantage of the Schwalbe Kojak is in the extra air volume. Run at the lower end of the pressure range they provide an excellent cushioned ride quality, while even pumped up to 100psi they virtually eliminate the high-frequency ‘chatter’ of a rough road. Without tread, the Schwalbe Kojaks can’t be recommended for riding in mud or wet grass, but you probably know that already. I do use them routinely on gravel paths where they are just fine, even in the wet. On tarmac the Kojaks are more confidence-inspiring than narrow road tyres, but perhaps not for the reasons you’d think. Contrary to popular belief, wider tyres do not in general have more grip on the road than do narrow ones (because the increased contact area is approximately cancelled out by the reduced pressure per unit area). However, that’s only considering a perfect surface. In practice, as the road gets rougher a wide tyre will stay in contact better, because it is providing suspension which just isn’t there with a rock hard narrow slick. The Kojaks, especially run in the middle or low end of their pressure range, absolutely help keep the bike in contact when the going gets rough! This is especially significant on the small front wheels of many recumbents. The only way to get more actual friction is to use a softer rubber compound, or add weight to the bike. Softer rubber doesn’t last as long, which is why expensive race tyres often have different compounds across the tyre profile (hard and low rolling resistance in the centre, tacky for cornering on the shoulders). Obviously the above is ranked by speed. You’d be silly to go touring on short-lived RaceStar compound, so it’s a more nuanced choice than that! The Schwalbe Kojaks have a puncture strip and, importantly, there’s plenty of rubber on that slick tread which also helps defeat foreign bodies. So far I’m up to 7 months commuting through central Edinburgh on my current Kojaks with one puncture (ironically when I lent someone the bike to demo around the block!) – that’s about 1500 miles. The treads have several good gashes in them, which at some point I might try putting superglue in, but no end-of-life symptoms yet (there’s still loads of rubber on both ends). As I ride a substantial distance on a disused railway path covered in glass, this is probably a fair trial of the tyres. Overall you can expect good mileage from the Kojaks – significantly more than a road race tyre, if not as much as the harder compound on touring tyres such as Marathons would yield. The Kojak on my Raptobike eventually failed when I tore the sidewall on an Edinburgh-tram-related portage up a flight of steep city stairs! Pilot error… but it’s worth being aware that fundamentally low rolling resistance and a supple, less robust sidewall go hand-in-hand. While I happily ride Kojaks on hardpack or well-trodden dirt paths (like the Union Canal towpath), I wouldn’t use it to ride on green roads or anything more adventurous where a stray rock could trash the sidewall. However, the weight penalty is fairly modest with the 700×35 Kojak giving up 40g to the 700×28 Durano and, as noted above, it’s much lighter in 26″ than the Conti Gatorskin (in 700C, folding Gatorskins are lighter than the Kojak). The Kojak is my current favourite all-round tyre. I don’t have them fitted to my Strava bike or my hardtail mountain bike, but otherwise they’re my first choice for all applications. They feel confidence inspiring in town, laughing off road defects just as easily as they take on unsurfaced (but not muddy!) paths. They spin up to speed quickly and seem to roll for ages. They’re also competitive head-to-head – in fact at the time of writing I hold a couple of Strava KOMs in Edinburgh on Kojak tyres! They have a respectable life and they’re also relatively cheap – 26″ ones are currently going for £18 on ChainReaction while I paid £12 each for my 700x35s from Planet X (you should be able to pick them up for £20-25 a piece outside of sales). Note: The internet suggests these tyres are generally a couple of mm narrower than their nominal width, and on a 17mm rim my 700x35C Kojaks are 33.5mm wide. Do you have an opinion on their behavior in snowy or melted-snow-sludge conditions? Useable? 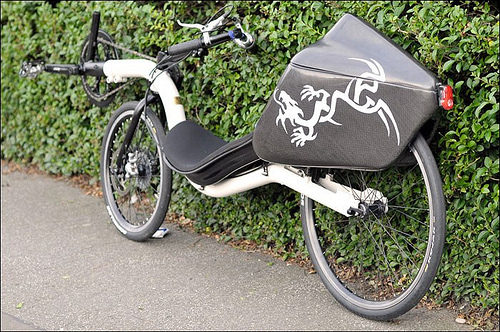 Several recumbent riders in NL swap kojaks for marathons or marathon plusses in winter for their extra grip. Is that needed or would you just cycle on? If the snow is just slushy then the Kojaks can be OK (if they are hard enough to contact the road they can still be pushing the snow aside) but of course they aren’t ideal, just like on mud. I’ll have an article on those soon too. 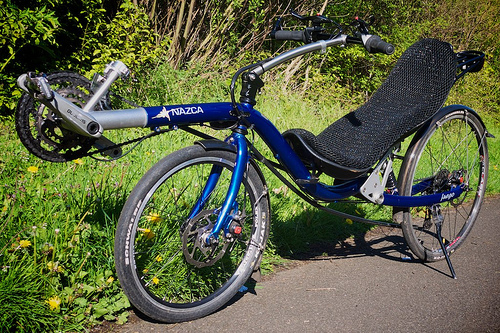 I’ve been riding the Kojak 559 2″ on the rear of my recumbent for more than a year now… can hardly see any wear. Switched to the wider tire because the Durano 1.1’s would slide out on me in any kind of dirt or sand. Very much enjoying the better ride comfort and superior grip on the back end and I can’t really tell much of a difference in the weight even though it’s about 200 grams heavier (Both Durano and Kojak are folding). Still riding the narrow tire up front. Considering a Big Apple for the rear in 2″ (Largest size that will clear the frame). Have you ridden the Big Apples? Can you contrast to the Kojak? Wondering if there really is going to be another jump in comfort from the Kojak to the Big Apple. I haven’t ridden the 26×2.0″ Kojak, but I have ridden the Big Apple in both 26″ and 20″ sizes. It’s definitely a level above the 1.35″ Kojak in terms of air volume. I would expect the Big Apple to roll a little more slowly, but the tread might improve it for loose surfaces. I must admit, I’m finding 28mm Continental Grand Prix tyres on light rims no quicker than 32mm Bontrager Racelites on heavy(ish) rims over any distance on real roads. All this on an upright. The pothole bashing confidence 32s give me over the 28s is noticeable. 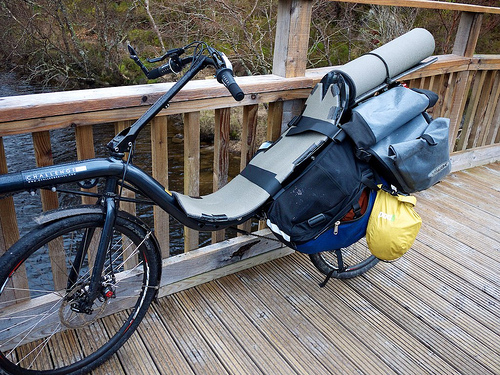 In fact, I have no idea how people could ride on 23mm tyres, I sold my RANS recumbent mainly because it was on 650 wheels for which I could only get 23mm tyres. Good morning to you, I am starting to bicycle I use a mount bike and its challenging, I want to buy a use bike if I can, let me give you some background, I am a 275 pound men and I want to buy something that will last me a long time and whole my weight, their is a lot of bicycle out there and I don’t even know where to start so if you could give me some advice regarding that issue, thanks for your time and have an awesome day. You’ve got great reviews, with plenty of detail here! I wondered whether you could comment on the Kojak (or other tyres) and their ability to cope with the cobbled stretches of Edinburgh, in different weather conditions. I imagine common sense will dictate simply not tearing around corners on wet or icy cobblestones, but am still hesitating between the Kojaks and some other Schwalbes to adapt an MTB (currently with knobbly Panaracers) for city riding. Thank you! The Kojaks are a good choice for both wet and dry conditions. The only thing to watch out for is that the smooth tread is not ideal when riding over leaf mulch, and they would be poor in lying snow conditions. Other than that, tread on bike tyres for riding around town is pretty cosmetic. It will go like a rocket compared with knobbly ones! As I mix it up on mud paths in some parts of my current commute, I ride Marathon tyres (whatever is on sale whenever I need one – Marathon Racer, Plus, or plain flavours at the moment). If I didn’t, then the Kojak was my tyre of choice for a couple of years commuting beforehand. bought the tire a few days ago. in 35-622. on the road great grip. precise steering. i use 3.5 bar (50psi) in front and around 4 bar in rear. the bycicleroads in hamburg are realy bad and rough. tire is stable enough to consider even 3bar (43psi) but i am only 70-72kg heavy. i use the 15% tire drop rule of thumb. gives a great balance between grip/confort/rollresistance. 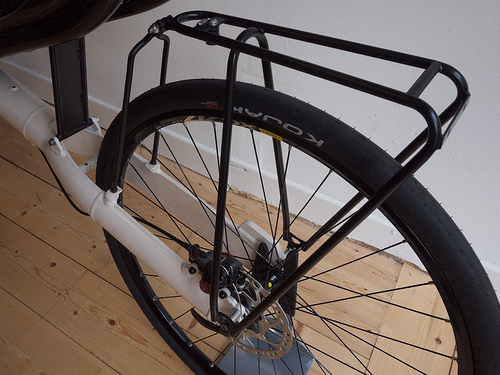 most ppl overinflate the tires just for the sake of rollresistance. wich is good on perfect roads but not on the rough ones i used to see. I want to buy these tires, but I can’t grasp one thing: Are they tubeless or tubeless ready? I want to mount them on a standard, regular, non-UST rim with an internal tube. So, what I am trying to achieve here is to mount a pair of Kojaks on my regular, non-UST rim WITH an internal tube under the Kojaks. Can it be done? So far, on the rim there is regular, standard non-tubeless tire with an internal tube underneath it. I want to achieve the same thing with the Kojaks. Can it be done? They are normal tyres, so using them on a rim with an inner tube is the normal way. Great review! I might have to try some of these on my next 650B conversion..